Turkey’s central bank met on Tuesday for the first time since President Recep Tayyip Erdogan was re-elected with enhanced executive powers. Though many expected the bank to raise interest rates to prop up the struggling lira, it decided instead to leave rates unchanged, causing the currency to fall once again – this time by 4 percent relative to the dollar before recovering slightly. Erdogan has long supported cutting interest rates to encourage borrowing and boost investment. And his new powers, which include appointments to the central bank, give him even more influence in this regard. But the bank’s decision not to cut rates puts into question how much power the president really has over monetary policy. Specifically, Erdogan's new powers enable to appoint the central bank governor. (Previously, the president, prime minister and deputy prime minister jointly appointed the central bank governor, but under Turkey’s new executive presidential system, the post of prime minister no longer exists.) The six other members of the board of governors are elected by the bank’s general assembly. But he had already decreased the term limit for the governor from five years to four years and eliminated the requirement that deputy governors must have a decade of experience before being appointed. This has naturally raised questions about the bank’s independence. Politicians often push for loose monetary policies that decrease interest rates to make borrowing cheap and to spur investment and economic growth. The downside is that low interest rates increase debt and raise inflation, which can decrease the value of the country’s currency. But the economic benefits often materialize faster than the drawbacks, so politicians are somewhat predisposed to support low rates. The independence of a central bank is meant to ensure that decisions made by the bank aren’t driven by short-term political interests. Erdogan has long advocated for low interest rates, even though it could further weaken an already weak currency. While Turkey has experienced high economic growth rates (7.4 percent in the first quarter of 2018, the most recent figure available from the government’s statistical agency), it has also experiences high levels of inflation (over 15 percent in June). A cheaper lira means staple goods, especially those that are imported, become more expensive for Turkish consumers. 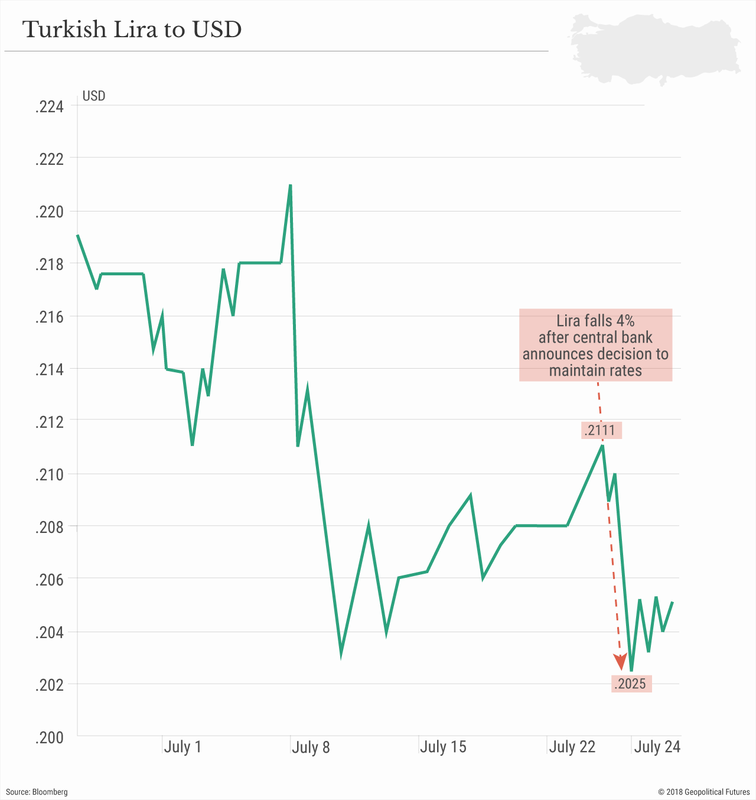 And the declining lira is even more concerning given the increasing dependency of the Turkish economy on external debt (that is, debt denominated in currencies other than the lira). Turkey’s central bank responded earlier this year by raising rates by 5 percent in total, bringing its benchmark rate to 17.75 percent, but the currency has continued to plummet. The markets have, therefore, viewed Tuesday’s meeting as a litmus test for Erdogan’s new powers over the central bank. Financial analysts claimed that an increase in interest rates would be an indication that the central bank has maintained some of its independence and that a decrease (or even holding at current rates) would be a sign that Erdogan is now dictating monetary policy. This framing is useful but not comprehensive. It ignores the fact that the fundamentals of Turkey’s economy haven’t changed, and Erdogan faces the same set of bad choices that he did before the recent snap elections. If interest rates go up, they might slow the fall of the lira, but they could also imperil the credit-fueled growth that has been a lynchpin of Erdogan’s economic policies. If interest rates go down, GDP growth might continue to climb, but inflation would also go up and the lira would fall. So while the 2017 referendum on presidential powers and the recent snap elections have indeed given Erdogan sweeping new powers, they’re not enough to change Turkey’s economic reality. Erdogan knows that keeping rates low isn’t a long-term solution, regardless of what he says publicly. It’s a useful political tactic in the run-up to an election, but having secured a new five-year term that arguably makes him the most powerful leader in Turkey since Mustafa Kemal Ataturk, he will be more willing to make difficult decisions. Even if Erdogan did have complete control over the central bank, at this early stage in his new term, he may well be willing to take steps that stabilize the lira, even if they hurt GDP growth, in the hopes that he could make necessary structural reforms before the next election takes place. Slower growth is, for the time being, politically tolerable for Erdogan. A run on the lira that could lead to a currency crisis would threaten the Turkish financial system itself.